The 2nd Annual Starr County Community Festival committee has been hard at work planning and finalizing preparations for the annual fundraiser. Last year the festival was very successful and the members are hoping for an even bigger success this year. Over 300 Starr County Children received a uniform shopping spree at Wal Mart through monies raised and with the support of the community many more children will begin the school year with a brand new uniform. The Starr County Community Closet also assisted many families in dire need of clothing, housing and other essential necessities. This year the festival which will be held on July 14, 2012 at the Starr County Fairgrounds will be host to a Team Roping Competition, Live Music throughout the day, A Poker Tournament, Poker Run, Kid Rides, BBQ Cook- off, Food Booths,Car Show, and much more. The committee members and volunteers worked very hard to provide entertainment for every age group. Commissioner Eloy Garza, Judge Eloy Vera, Anna Villarreal SCCC Director and all of the SCCC Board Members and Committee Members wish to invite you to attend this spectacular event. Admission will be $1.00 and the tickets for the kid rides will also be $1.00 for each ride or a bracelet can be purchased for $10.00 per child and will entitle them to unlimited rides. Anyone who wishes to volunteer at the center or the festival is encouraged to call the Starr County Community Closet at (956) 488-2025. Pictured SCCC Board Members and volunteers. 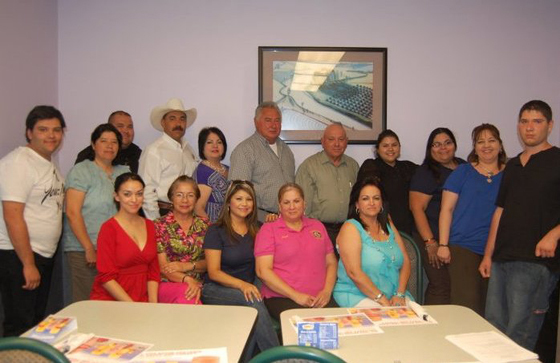 (Starr County Public Relations Office).